Welcome to The Rubber Track Warehouse - where we specialise in supplying high quality rubber tracks (both bolt-on and clip-on), rubber isolators/buffers and track pads. Our rubber track pads are ideal for excavator operators with steel tracks, who want the benefits of less vibration and noise, better traction and less damage to paved surfaces. The Rubber Track Warehouse can supply bolt-on or clip on track pads for a large range of machines. We have a huge range of all items available in stock, and pride ourselves on providing high-quality products at competitive prices. We can arrange delivery within 24 hours to most North Island and many upper South Island locations. 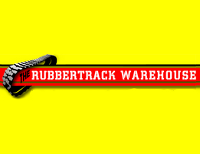 The Rubber Track Warehouse has been the leading suppliers of rubber tracks and track pads in New Zealand. We are focused solely on rubber tracks, track pads, and isolators. We have exceptional quality and extremely price competitive. Also we are 100% New Zealand owned and operated! Jeremy has a background in the Sales and Marketing sector, prior to his association with The Rubbertrack Warehouse he was the national sales manager for a major division of Carter Holt Harvey! For over 20 years Brian has been involved with rubber tracks, constructions, and also roading. Brian is a qualified mechanic. and is the in-house expert of this company!